Join the stand-up revolution with a sit-stand desk, designed to get office workers up and moving more. Choose from a variety of sit-stand desk shapes, sizes and mechanisms to fight aches, injuries, cardiovascular disease and other unhealthy effects of prolonged sitting. 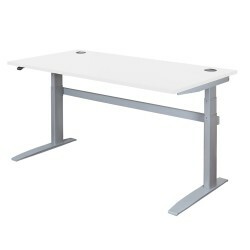 A sit-stand desk (also called a stand-up desk) is a desk which can be either manually or electronically adjusted to sitting or standing height to prevent problems associated with prolonged sitting. ‘Stance shape’ – an angled section that allows you to move easily from computer work to paper work. An adjustable height sit-stand desk gives you the option to sit or stand throughout the day, keeping your muscles active and reducing the risk of aches and pains caused by repetitive movements. What are the benefits of a sit-stand desk? Increased alertness, concentration and productivity. Relief from muscle ache caused by static posture. Flexibility to adjust your working position to the task at hand. If you're still not sure which desk is the best for you, call us on 0845 345 0010 and one of our advisers will be delighted to help. All height adjustable desks come with a five year guarantee and we will personally setup larger installations at your office. Please note that we only stock certain sizes in our warehouse. For stock sizes, delivery is 3-4 days. Other sizes will take up to 6 weeks.